When Cookies told me he took pork chops of the freezer I was like… WTF loin cutlets AGAIN??? 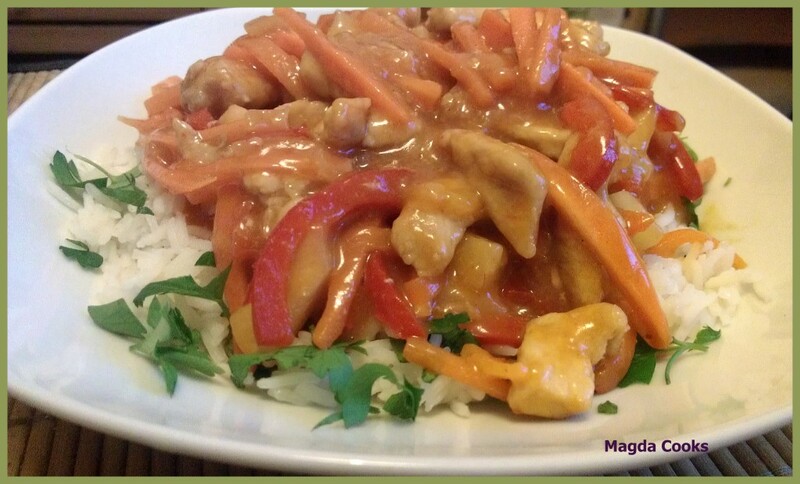 I thought I won’t manage another typical meal and I started thinking what to prepare… I looked at PINTEREST for some ideas and saw recipe for pork with pineapples which reminded me couple years ago I created my own sweet & sour pork. That thought relaxed me and made me look into cooking tonight with a grin on my face. Of course by mistake the whole meal become pork with a bite 😉 I used spicy ketchup and I mean a really spicy one which caused the sauce to be really hot, but still very eatable. Cut chops into strips, sprinkle with salt, crushed/ground chili flakes and with 1 tsp starch, coat nicely and set aside. Cut all the veggies into julienne (matchsticks) and onion into half slices then separate into singular pieces. Using a teaspoon peel the skin of the ginger and shred it. In a bowl mix all the ingredients for sauce, stir good and set aside (you may have problem dissolving starch in the thick mixture, use 1 tbsp of cold water and then add it to the rest of the sauce). Heat wok or deep skillet with some vegetable oil, when hot toss ginger and garlic, stir fry for 20s and add onion, stir fry another 30s then add meat. Keep stir frying another 3-4 minutes until meat starts browning. Toss carrots and pepper, keep stir frying! Add soy sauce, after another 2 minutes add mixture. Stir thoroughly, cover and on low heat boil for 2-3minutes. P.S. Cookies thoughts: Too break coloring... HAHAHA, this meal seriously was awesome. Tasty and I'd say it was BETTER with Pork than with CHIX (chicken! 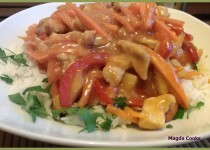 ), and yes, again, Magda Cooks... it just right!